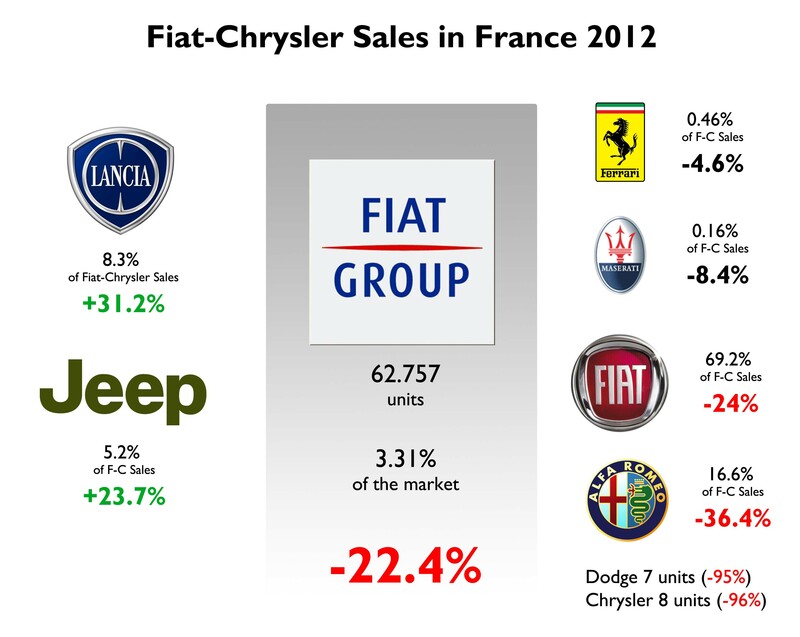 France is another big European market, which is important for Fiat-Chrysler. Last year it made part of those car markets with big falls just as it happened in Italy and Spain. However French car market did not fall as much as Italian one, but it was surpassed by the UK as the second largest car market in Europe (not included Russia). Last year results confirm that it is a strong nationalist market, where competition is really hard for foreign players. French love to buy french and that’s why only those segments with french representation are the ones with high sales registrations. This market is very important for Fiat-Chrysler in Europe as it is where the group has the highest market share among the 3 big in Europe: Germany, UK and France. Actually French car market is quite similar to Italian one and that’s why some Fiat products continue to do good in terms of sales, no matter the bad times. Two digit fall in 2012. 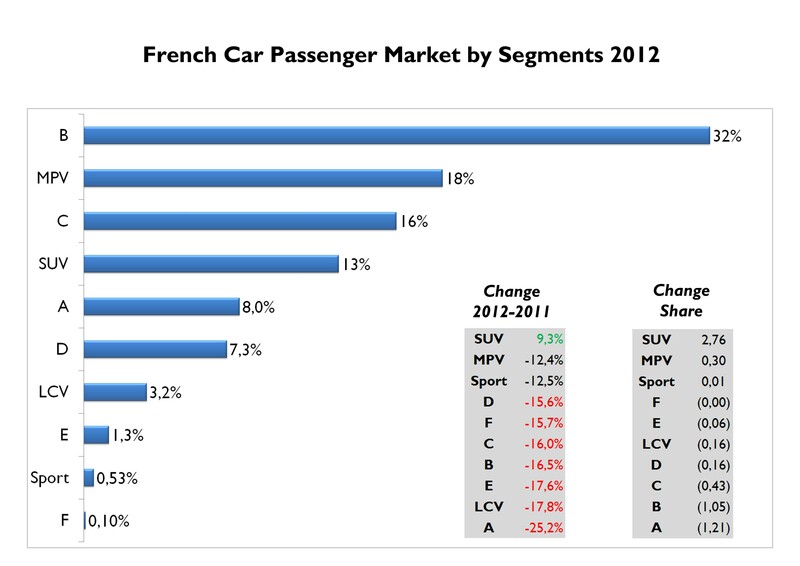 That’s the result for car registrations in France, where almost all car makers had very bad results. Looking at the result for the last 5 years, 2012 was the worst in terms of volume: only 1.9 million cars were sold, compared to 2.27 million in 2009, a record year. That’s almost 400.000 units that French and foreign car makers don’t sell anymore. PSA and Renault are having big problems with the extreme fall of their home market. They are not only losing market share against Germans and Koreans, but their production levels decreases as they decide to move the output to other countries. Current European crisis is affecting all car makers, but it seems that PSA is the one with the biggest problems in terms of profits. 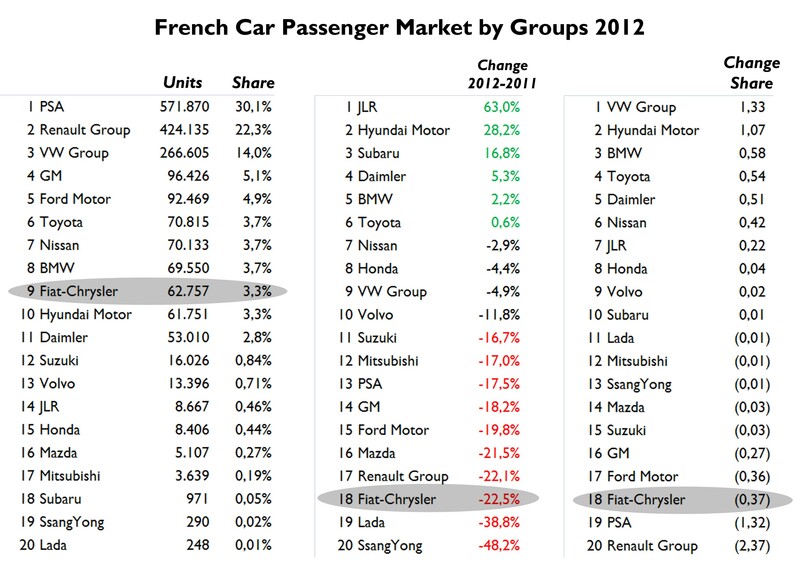 Last year Renault and PSA got 52% of total sales against 54% in 2009. It means that France is one of the most nationalist car markets in Europe and as it happens in Italy with local products, consumers continue to buy french no matter the crisis. Last year’s fall had a bigger impact on Renault, GM, Fiat, Ford and PSA sales while VW and Hyundai increased their quota thanks to their products. That’s why French authorities have said that Korean imports should be controlled as they may be distorting the market. 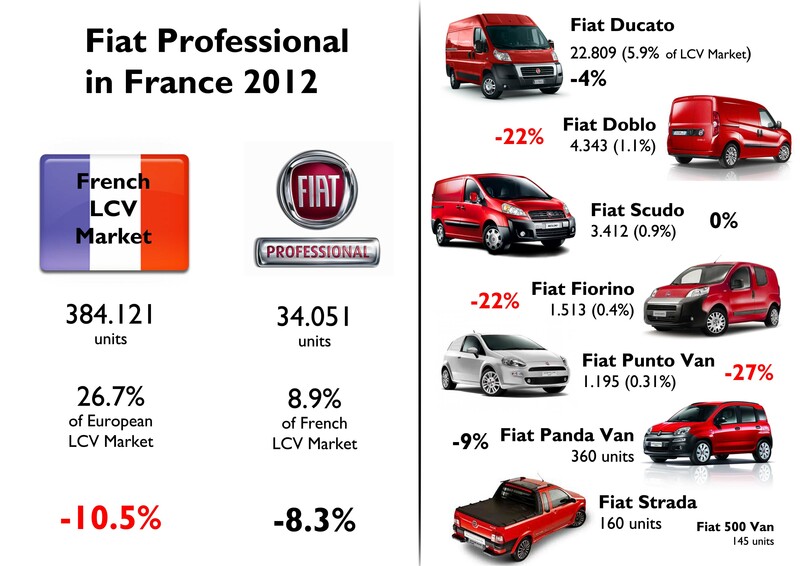 As it was cited above, French car market is very similar to Italian one in terms of sales by segments. The only important difference comes from city cars and MPV. 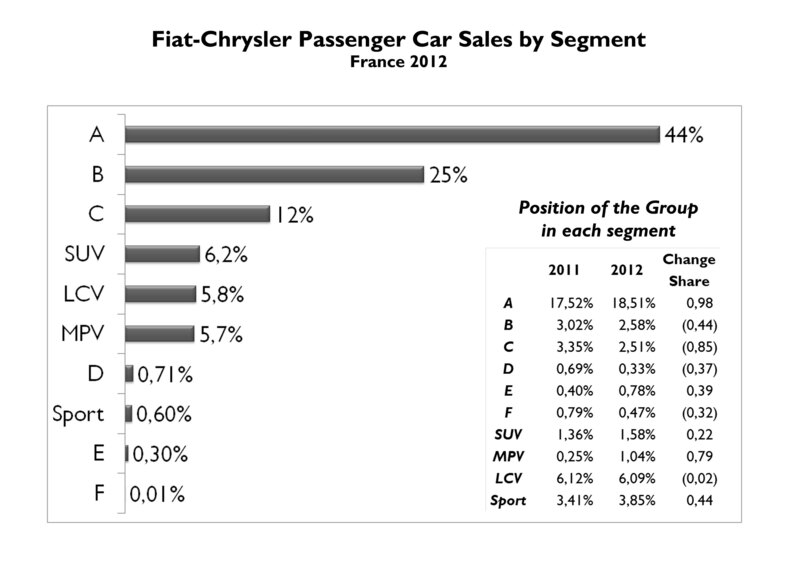 In France they love minivans while A-segment cars are not as popular as in Italy. That’s how B-Segment cars count for 32% of the market, followed by minivans which have 18% of sales. With last year’s fall the only two segments to enlarge their share were SUV and MPV while city cars and B-Segment ones had the worst performance. 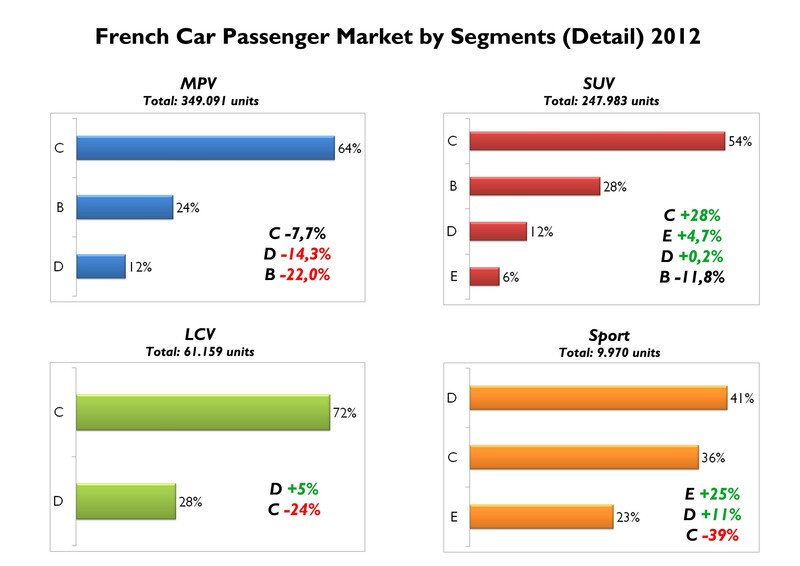 French car makers are very strong in B, C and MPV and they are now working on increasing their presence in SUV. Even though last year the group had a bad result in terms of growth, France continues to be the European market where almost all the its brands have interesting results. Contrary to Germany, where Fiat brand counted for 80% of sales, and Alfa Romeo and Lancia are considered marginal brands, in France the sales composition by brands is more balanced. Actually, France is Alfa Romeo and Lancia’s second largest market after Italy. It allowed them to have better market share than in Germany, and the group is not that dependent on one brand. This balance could be the reason for the group’s deep fall in terms of registrations last year. Fiat brand fell 24% but Alfa Romeo, strongly affected by the lack of new products, fell 36%. Things could had been worse if it wasn’t because of Lancia, up 31%, and Jeep, up 24%. The healthy mix allowed the group to control the fall at ‘only’ 22% (Iveco not included). 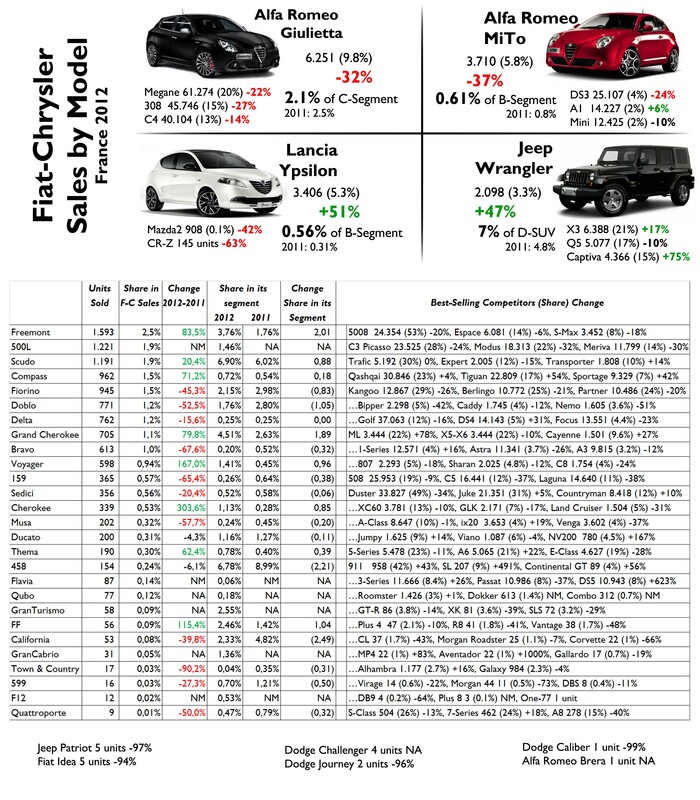 But that was the worst result among all car groups: Fiat-Chrysler had the biggest fall among all car makers, only surpassed by Ssangyong and Lada which got 0.02% and 0.01% of the market. This alarming result allowed 3 groups to surpassed Fiat-Chrysler in the ranking and Hyundai Motor gets really close. Now Italians are not the best-selling group after locals, VW, GM and Ford. Last year Toyota, Nissan and BMW groups sold more cars than Fiat-Chrysler. 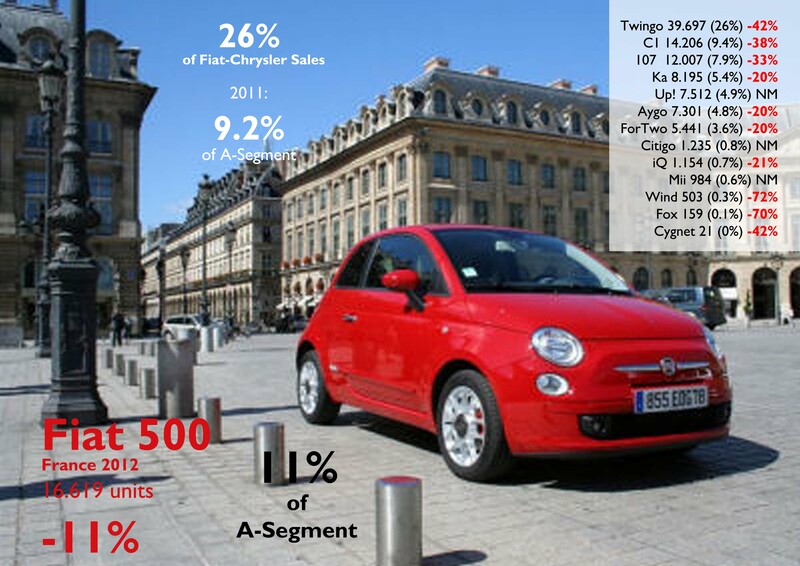 44% of the group’s sales correspond to city cars (a segment that counts only for 8% of French total market). 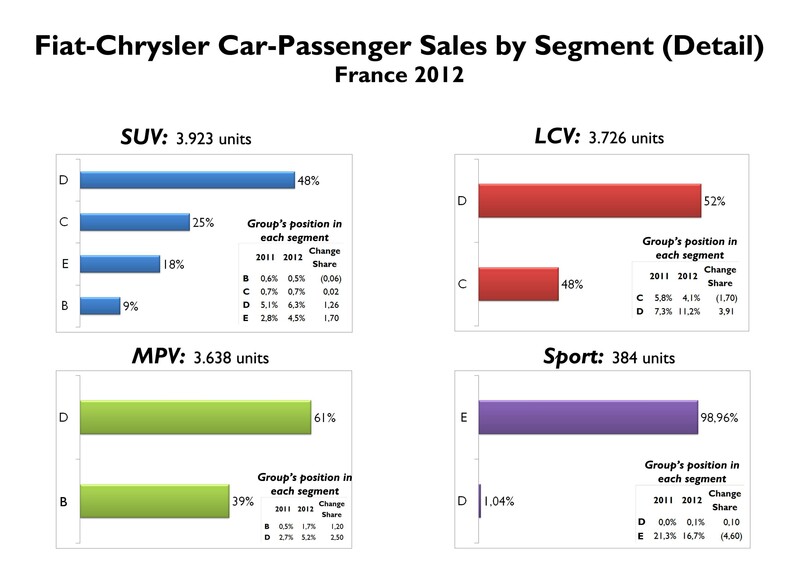 Then comes the B-Segment, with 25% share, and C-Segment counting for 12% of Fiat-Chrysler sales. So, A, B and C segments count for 81% of the group’s sales, followed by SUV, LCV and MPV with very small and similar shares. Once again the demand is very concentrated in few segments, and some of them are not quite important in France. The presence of the group in MPV is still very marginal. The 500L should help. Regarding the position of the group within each segment, certainly it can only feel comfortable in A-Segment, where it controls 19% of its sales. In the other segments its share is really irrelevant. The group owns 6% of LCV segment (passenger LCVs). It’s a shame that the Punto is not anymore the foreign option French had when thinking of a B-Segment car. This car explains part of the mess of last year. 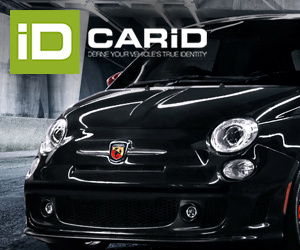 When looking at the group sales by model there must be a consideration: Fiat Professional. If this brand is included in the analysis, then the best-selling model would be the Ducato, as it happens in Germany. But this analysis will concentrate on passenger brands and will analyse Fiat Professional separately. In this context the 500 is the best-selling car of the group. French love it and you can notice in Paris streets. No matter its age it continues to be one of the best-selling city cars in France and even last year it surpassed some locals, such as the Citroen C1 and Peugeot 107. Even if it has not received a deep update, the 500 sales are more stable than its direct rival, the Renault Twingo, which got its first facelift last year but its sales dropped considerably. The second place goes to the Panda, which had a terrible result but is still one of the referents of small 5 door city cars. Contrary to what happened in Northern Europe and the Netherlands, the VW Up! 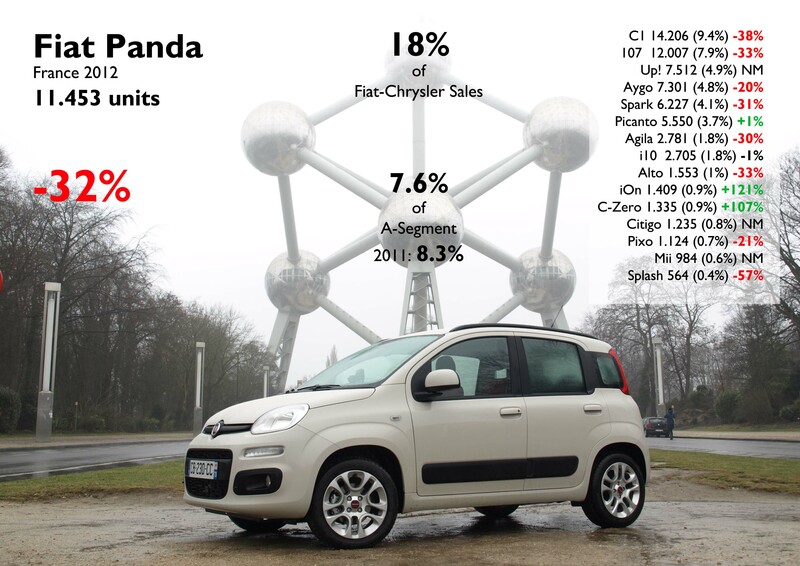 did not shine in France but had a negative impact in Panda’s sales. 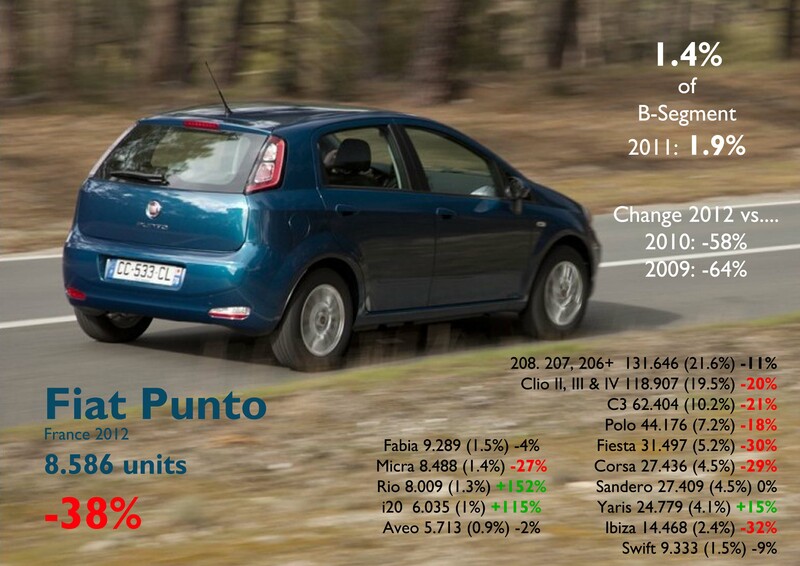 The Punto completes the podium with only 8.600 units sold. This is a shocking result considering the fact that 3 years before, 24.000 units were delivered. These 3 product count for 58% of the group’s sales. The Giulietta did a good job too, but competition is tough and this car lacks of other body types, such as 3 door, which are also popular in France. Despite its fall, the MiTo impresses as it is the 5th best-selling passenger car of the group, contrary to what normally happens in Italy, Germany, the UK and Spain, where it is extremely unpopular. Very good news coming from Lancia with its Ypsilon up a massive 50%. France is Ypsilon’s second largest market aswell. The Voyager and Thema did also very good, but they are still very far in the ranking. Jeep had a great year thanks to the Wrangler, up 47%, and surprisingly the 7th best-selling car of the group. It is perhaps the best position of this model outside the USA and Canada. The Grand Cherokee and Compass jumped 80% and 71%, but they need more to reach important numbers. Finally, the Freemont is far from its French rivals, but is up 83%. All these American-made models had better performance than European Delta, Bravo, Musa and 159. The 500L had a good start with more than 1.200 units sold in 4 months. 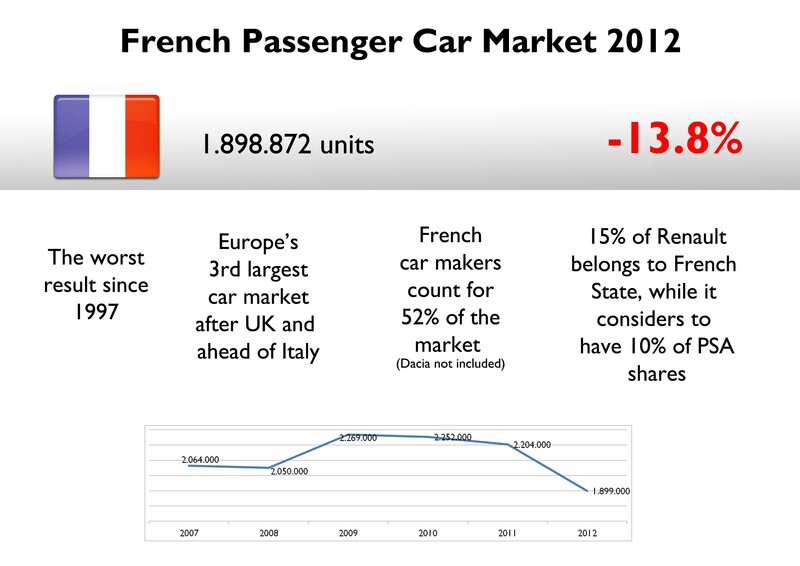 As the rest of Europe, French car market should continue falling in 2013. Most analysts expect the market to shrink around 3%-5%. I believe sales registrations will decrease but the fall will slow down to -6%/-7% to 1.765-1.784 million units. The forecast is based on bad economic perspectives for Europe and France, partly affected by rising unemployment rate and the decision of French car makers to reduce costs and investment in their home land. Fiat-Chrysler will lose market share for several reasons. The first one is that there will not be any important new products this year, so model composition wouldn’t change in a market that falls and has more competitors. Second, because the success of the 500L may be negatively affected by the fall on demand of the Giulietta, as the new Golf will do very good. The 500 may have small problems with the arrival of the new Opel Adam, that will not succeed as the Fiat, but will catch some of its future buyers. Not having a competitive B-Segment product will be a complete disaster for the sales of the group in France in 2013: the new Clio and 208 will punish the already bad sales of the Punto. 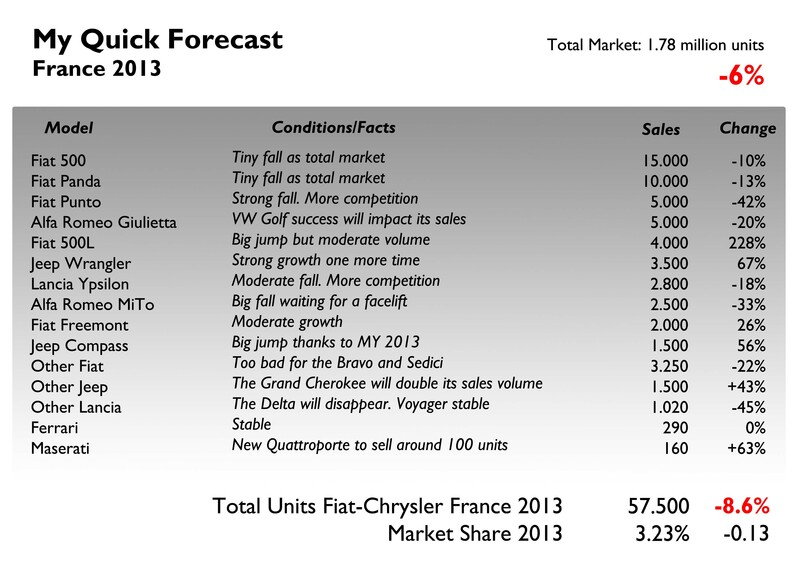 The good news will come from the new Grand Cherokee and Compass MY 2013 that should arrive in France shortly. The 500L will also perform good.